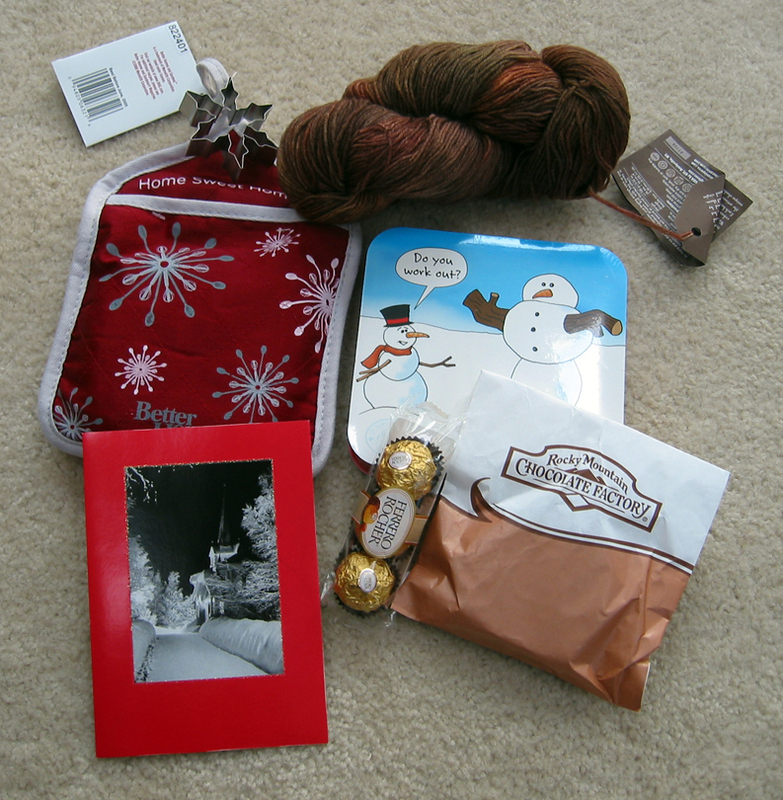 Yes, I am still kind of out of commission, but I did want to interrupt this irregularly scheduled break to show you the package I got from Kati as part of the Winter Wonderland swap. In the bag were chocolate covered pretzels. An oven mitt with sugar cookie mix and a snowflake cookie cutter. 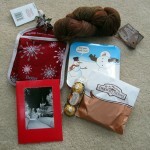 The snowmen box contains Elmer’s chocolates. A Christmas card from Kati and her family. My package to her is on its way, and should hopefully arrive later this week. I hope everyone it doing well. Back into exile for me! This entry was posted in All about me, Swap by textillian. Bookmark the permalink. ooooooooooo, that colorway looks luscious!! Glad it all got to you safe! Have a Safe and Happy new year! What a great package! I adore that yarn. I love me my earthtones. What a nice swap gift! I have some Araucania yarn that I have not knitted up yet. Will we be seeing what you sent her after she receives it?